YEKATERINBURG, Russia (AP) Seven teams have won their first two World Cup matches, and six of them are through to the next round. El Tri still may need points to secure a place in the round of 16 for a seventh consecutive World Cup. Victories over defending champion Germany and South Korea weren’t quite enough. If Sweden beats Mexico on Wednesday and Germany beats South Korea, three teams would be tied atop Group F with six points, sending it to tiebreakers that start with the best goal differential. 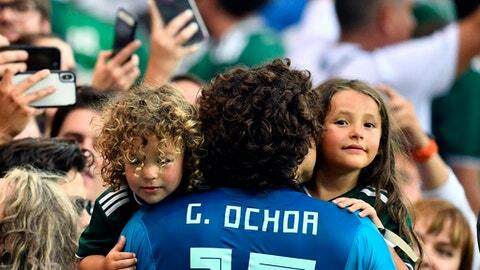 Mexico goalkeeper Guillermo Ochoa said there wasn’t any panic when he and his teammates learned they had unfinished business in their final game. If Mexico and South Korea both win, Mexico would win the group and every other team would be tied with three points. Sweden hasn’t made it to the second round since 2006. And like Mexico, six points wouldn’t necessarily be enough to advance. The Swedes might end up needing to win by two goals, depending on what Germany does. Mexico upset Germany 1-0 in its opener and then dispatched South Korea 2-1. It looked like those results would be enough for Mexico to advance, but then Toni Kroos scored deep into extra time to give Germany a 2-1 win over Sweden, setting up the various scenarios that will come into play during Tuesday’s simultaneous matches. Swedish midfielder Jimmy Durmaz was subjected to racial attacks from fans on social media after the loss to Germany. Durmaz entered the game as a substitute, and his foul gave Germany the free kick that set up Kroos’ game-winner. Durmaz was born in Sweden to ethnic Assyrian parents who emigrated from Turkey. He’s been called a ”terrorist,” and vitriol has also been directed at his family. The online abuse was reported to police. A two-goal victory by Sweden would guarantee it a spot in the next round. But that’s easier said than done. Sweden has just two goals for the tournament, by Andreas Granqvist and Ola Toivonen. Marcus Berg, who had eight goals in qualifying, has been held scoreless despite a team-high six scoring opportunities through two games. While Mexico’s defense has been solid, Ochoa is the biggest reason that El Tri have given up just one goal in the tournament. Known by supporters as ”The Great Wall of Ochoa,” he has been a steadying presence for Mexico and has a tournament-high 14 saves. He stopped nine shots against Germany and five against South Korea. Denmark’s Kasper Schmeichel is next with 10 saves.